This delicate, rose petal polish combines a subtle hue with a high coverage finish. 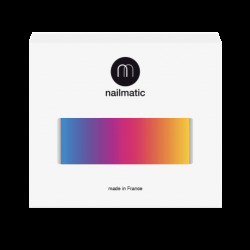 Its gentle color is echoed in its nail-friendly formula, made from 84% plant-based ingredients. A new modern classic! Our Jeanne nail polish has the edge with its eco-friendly 10-free formula! - Enriched with plant keratin and starflower oil to make your hands happy. Make your manicure easier with our 2-in-1 Base & Top Coat for two nail essentials in one handy package. Bonus! What does that mean? Its cleaner formula is made from natural and renewable raw materials, such as manioc, potato, cotton and maize. Petrochemical solvents are replaced with plant-based alternatives. Result! And as for toxic nasties, our PURE color range is free from paraben, toluene, dibutyl phthalate, formaldehyde, xylene, styrene, camphor, resin of formaldehyde, benzophenone-1 and nanoparticles. Made in France with love and care. First thing’s first: remove any remnants of polish and wash and dry hands thoroughly. A clean surface is the secret to a long-lasting, smooth manicure! 1. Begin with a layer of base coat. No cheating – this step is the foundation for your color and is not to be skipped! 2. Apply one coat of Jeanne by painting three brushstrokes onto the nail: one down the centre, followed by one either side. Leave a millimetre gap between the cuticle and color. This pro-technique is easy as cake thanks to our wide brush. 3. One coat of color is enough, but apply a second for increased coverage. 4. Finish with a slick of top coat for an even glossier, longer lasting manicure. Add an extra coat 24 hours later for even longer wear. - Jeanne adapts to every situation – from a wedding to Sunday brunch to a smart business meeting. It’s a beauty essential! - For perfectly shaped nails, cut your nails slightly longer than the desired length and then neaten up the edges with a nail file. Ingredients: butyl acetate, ethyl acetate, nitrocellulose, isosorbide dicaprylate/caprate, adipic acid/neopentyl glycol/trimellitic anhydride copolymer, alcohol, stearalkonium bentonite, acetyl tributyl citrate, isopropyl alcohol, diacetone alcohol, n-butyl alcohol, borago officinalis (borage) seed oil, phosphoric acid, hydrolyzed corn protein, hydrolyzed wheat protein, hydrolyzed soy protein, silica, leuconostoc/radish root ferment filtrate, ci 77891 (titanium dioxide), ci 15850 (red 6 lake), ci 77491 (iron oxides).